good place with breakbeat, drum and bass & dubstep music. I created this mapping because Traktor never put the grid marker at the good place with breakbeat, drum and bass & dubstep music. And because the auto adjust level of the gain is too high & i'm alwas in the red. So now each time i load a song (with auto-adjust gain mod) I always decrease the gain level. This mapping allows you to assign all the 4 FX units to all the decks whereas with the original embedded Traktor S4 mapping a given FX unit is dedicated to a given deck. Default keyboard map with a modifier to toggle on and off. Use "shift+backspace" and "shift+tab"
in response to typing in the search field and engaging the keyboard shortcuts. By holding down shift on either side and turning the loop recorder dry/wet knob, move the beat grid left or right on their respective sides. Is the old track running out before you've satisfactorily brought in the new? Press Shift+FX Mode to start the track looping, but the loop ends at the current play position. In effect this skips back by the currently selected loop length then sets a loop in the usual way. Shift and tempo offset down button sets a grid cue point. Shift and tempo offset up button locks/unlocks the grid. The tempo offset down button and its opposite shift deletes a grid point. An extra tsi in the zip additionally allows you to nudge the BPM of the track using Shift+Loop Size Set. Shift+Gain knobs for decks C and D control FX type of units 1 and 2 in single mode. Browse button turns off monitor, load buttons additionally turn off browse mode, turn off the track preview, and activate the appropriate monitor channel. This S4 Add-on mapping allows you to perform the basic beatgridding functions from your S4 controller. 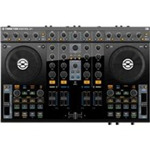 The default mapping of the S4 has no buttons mapped that allow to switch easily to absolute und relative timecode mode when you are using a single turntable two controll two Traktor decks with timecode. This little Add-On mapping for Traktor Kontrol S4 allows switching between relative timecode mode and absolute timecode mode from the controller. this is an extended tsi of the s4 user mapping to control beat sync toggle for scratching, that includes the tempo offset buttons to be used to toggle the sound of the opposite decks into other side of xfader. Called transform buttons in other software. this allows the jog push on the s4 to toggle off the beatsync when scratching then instantly sync again when released. The attached ZIP file contains two different mappings that disable the Gain encoders and allows to map other Traktor functions to them. 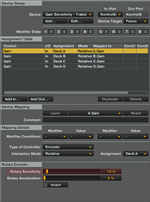 This mapping allows you to change the sensitivity of the Gain encoders. Removes all assignments between crossfader and the decks. See the accompanying Word document (in ZIP file) for a detailed description of each function. If you use another controller next to the S4 it can be useful still to be able to assign FX unit 1 and FX unit 2 to all four decks. To achieve this I created a small user mapping for the S4. It overwrites the restrictive default assignment in 4 FX units mode and re-enables the four disabled assignment buttons. 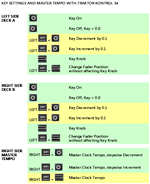 This user mapping uses the tempo faders and the tempo offset buttons to control key settings for deck A and B and it allows to change the Master Clock tempo.